Do you want to improve the photographs you take as part of your job? Do you want to supply the media with PR images they will love to use? Or do you want to reduce the cost of employing freelance photographers or make more money yourself? If you answered 'yes' to any of those questions then you'll love "The Secrets of Better PR and Editorial Photography" - a brand new book that shows you how to take great public relations and news photographs, how to set them up, how to handle individuals and groups shots and how to make your images more interesting. It looks at how you can use props to make your images come alive and shows you techniques to let you handle people shots, groups, portraits, event shots, presentations and much more. If ever you've looked at the photographs you've taken and thought "How could I make them better?" this book is for you. It explains the pitfalls behind taking these types of photographs and shows you how to prepare for the photoshoot - before you even leave your office. If you take photographs for a living or want to make money from your photography the book will show you the techniques to do just that. It also explains confusing terms like megapixels, JPEG, RGB, CMYK, TIFF, Ni-Mh and many more. How to prepare images for print and the net. How to embed essential caption information right inside your digital images using Adobe Photoshop or Photoshop Elements . How to make sure your batteries don't let you down half way through a shoot. How to take great informal portraits. How to work out how big you can use any digital image in print. And how to improve your image quality in just five seconds! The Secrets of Better PR and Editorial Photography is written by Steve Nichols of InfoTech Communications, who has been taking photographs professionally for more than 25 years. His editorial and PR photographic work has appeared in countless magazines and has taken him as far afield as Florida to cover Space Shuttle launches, Seattle to cover the design of a new Boeing supersonic airliner and to Singapore, Dubai and Abu Dhabi to photograph top airline executives. He has also run in-house digital photography courses for a wide range of companies including Standard Life, Novartis, Astra Zeneca, Diageo, Halifax Building Society, Herts County Council, Aviva and many others. It was these photographic training courses and photography seminars that inspired the book. Delegates normally pay more than $700/£450 per day to come on one of Steve's courses, but the core content has been distilled down into one downloadable resource manual, available to buy right now for just £12.99/about $19 (print) or as a digital download for your PC, Mac, iPad or Kindle for £4.99/about $8.50. Who is the manual aimed at? "Steve is a master photographer whose tips and advice have helped me to improve my photography immeasurably over the past two decades. Anyone looking for really practical guidance from an expert in the field need look no further than this volume. I cannot recommend it highly enough." "Photography is changing. Professionals are still vital for those really great images - but today’s communicators increasingly have to take their own. I've handled some awful amateur pictures while editing at a major UK corporation. But there can be no more excuses. Armed with this timely, user-friendly tome, the enthusiastic amateur can produce perfectly publishable photography." 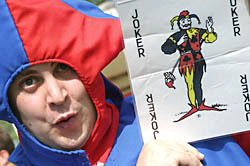 "Excellent, practical advice and lots of clever tips on how to make, not take, great photographs of people. If you want to learn the secret of good PR and editorial photography, buy this e-book." "This filled me with confidence to try more exciting compositions. It's about working with subjects, planning ahead and using your imagination. Steve doesn't dwell on technical stuff - instead he offers plenty of ideas to copy and practical tips to help you 'make not take' photos that really stand out." Editors and journalists working on in-house newspapers, magazines and intranets who need to take their own photographs, but don't know where to start. Journalists working on regional newspapers and magazines who now need to start taking their own photographs. Photographers who may have worked in other areas of the business, but now want to include PR and editorial work in their portfolio. Business owners who want to take their own photographs to accompany press releases or put on their web site. Keen amateur photographers who are looking to make money out of commercial, PR and editorial photography. And anyone who wants to improve their "people" photography. In the book you will also find lots of case studies, with the briefs that had been given and the end results that were delivered, so that you can see the thought processes behind how each picture was taken. If you love photography, and want to improve your picture-taking ability, this is a great chance to make a big change for very little money. 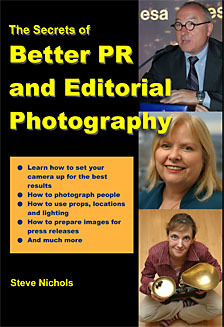 Your free download of the contents of "The Secrets of Better PR and Editorial Photography" is supplied as a PDF file. You will need the Adobe Acrobat reader software to read it, which you can get free from Adobe. To download it just right click on the link below and select "Save As" to download it to your hard drive. Apple Macintosh users can also right click or use "Control and click". Buy it in digital Epub form for iPad (£4.99/about $8.50). Or to buy it as a downloadable PDF (£4.99/about $8.50) for your computer or Kindle use the PayPal button below right.